I went a little wrapper crazy on a recent trip to the Asian market. For some reason, I felt compelled to pick up eggless wonton wrappers, gyoza, spring roll wrappers, and thin sheets of tofu. I didn’t really have anything in mind to do with any of them, and since they were all frozen, I figured I could take my time deciding. But somewhere in the back of my mind lurked a recipe I’d seen that used wonton wrappers to make ravioli, so I decided wonton ravioli would be my first use of my huge wrapper supply. I’d like to call this a Ridiculously Easy recipe, but I can’t. 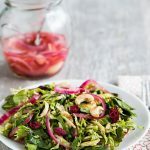 Though using wontons is easier than making pasta from scratch, any time you have to fill or wrap anything individually–spring rolls, sushi, gyoza–it’s a time consuming process. Though these ravioli were pretty simple to put together, I still had to make a filling, stuff them, boil them, and make a tomato sauce. It took a while and after I finished, my kitchen looked like the scene of a battle between the forces of Corn Starch and Blended Tomato. When my husband came in to clean the kitchen (as per our longstanding agreement that whoever doesn’t cook washes up), he was confronted with a tofu-porcini encrusted bowl and food processor, a blender coated with tomato reside, multiple pots to wash, and counters dusted with cornstarch. Nothing easy about that, but at least I didn’t have to deal with it! So how do wonton wrappers taste as ravioli? In a word, thin. 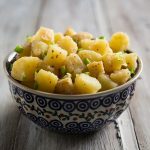 Though they swell when boiled and enclose the filling well, they lack the toothsome thickness of real pasta and, therefore, aren’t quite as filling as the real thing. And, as you can see from the photos below, their thinness allows the color of the filling to show through, which in the case of this mushroom filling isn’t really aesthetically pleasing. They are also quite large, so next time, instead of using two wrappers per ravioli, I will use one and fold it over into a rectangle. I have to say that these were a little bit of work, but still, it’s been a long time since I’ve had ravioli, and to be able to whip up a batch on a weeknight was a treat. And I think they’d be amazing with the tofu-spinach ricotta filling from my favorite lasagna. Filling: Put the dried mushrooms into a bowl and cover with hot water. Soak for about 30 minutes, or until completely rehydrated. Drain (reserve liquid for another use) and put the mushrooms into the food processor. Pulse to chop. Add the remaining filling ingredients to the processor and puree until smooth. Sauce: Spray a medium-sized sauce pan with olive oil, and heat. Add onion and sauté until translucent. Add garlic and cook for another 2 minutes. Add the tomatoes and their juice and break the tomatoes apart using the edge of a spoon. Add remaining sauce ingredients, except salt and pepper, and simmer for 15 minutes. Then, transfer sauce to blender and pulse until it’s a consistent, coarse texture. Return to the pan and add salt and pepper to taste. Keep warm. Making the ravioli: Put a large pot of water on to boil. Dust a cookie sheet with cornstarch and have it ready. 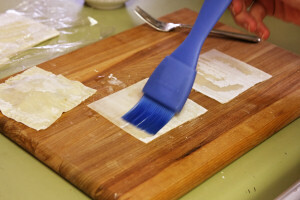 Take two wonton wrappers and brush one side of each with a little water. Put about one tablespoon of filling onto one of the wrappers (on the moistened side) and cover with the other one, moistened sides together. Press out any air around the filling and press the edges closed. 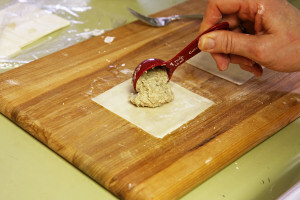 Seal the edges by pressing with a fork all around the outside of the wonton. 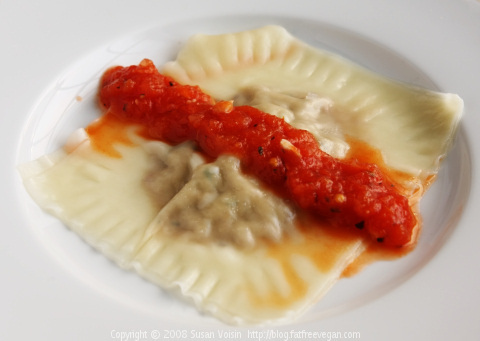 Place each filled ravioli on the cookie sheet and cover with a tea towel or plastic wrap. When all of the ravioli are filled, they may be kept covered in the refrigerator until you’re ready to cook them. Cooking the ravioli: When the water has reached a boil, turn down the heat enough to maintain a very gentle boil. Add half of the ravioli and cook until they bob up to the top of the water, about 5 minutes. Use a slotted spoon to remove them to a dish and cover. Cook the remaining ravioli. Serve 2 to 3 to a plate, topped with tomato sauce. Makes 4 servings, 10-12 ravioli. 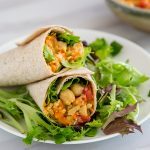 Per serving: 149 Calories (kcal); 3g Total Fat; (15% calories from fat); 8g Protein; 27g Carbohydrate; 0mg Cholesterol; 604mg Sodium; 4g Fiber. Weight Watchers Flex Points:2.
made this tonight, but just used one wonton wrapper per wonton, does that make sense? I made them into triangles. I actually doubled the recipe and freezed half (before cooking) for future use. my one year old ate a bite and seemed to like it but then spit out the next bite and my 3 year old ate just one wonton with sauce but that was pretty good for how he has been eating new things lately. I loved them and am glad I doubled the recipe. I am sure my husband will like them too, since he likes everything. I love this! I didn’t have the right ingredients for the filling, but I wanted to try this tonight. I chopped some kalamata olives and cremini mushrooms, seasoned them with some garlic powder, coriander, and a tiny bit of red pepper flakes, and used that as the filling. 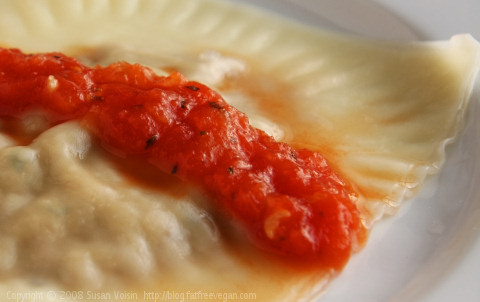 I’ve always wanted to try won ton ravioli, and I love how these turned out. 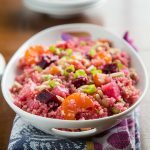 Thanks a million for this recipe! I look forward to trying it with your filling ingredients. Where do you find vegan wonton wrappers? I can’t find them anywhere! The only place I can find them is in Asian grocery stores, and even there, you have to read labels carefully because not all are vegan. The ones called gyoza rappers are more likely to be egg-free.